The guerrilla movement in Iraq struck with three strategic attacks and several lesser ones on Sunday. A suicide bomber targeted US troops at a patrol base in Rashad near the oil city of Kirkuk on Sunday, killing one US soldier and wounding 19 others. Two Iraqis were also wounded in the blast. On Saturday, guerrillas used a roadside bomb to kill another GI. AFP says, “At least four civilians were killed and 23 wounded in the deadliest attack at a police centre in the Al Yarmuk district of western Baghdad. . .” The bombing struck at police recruits standing in line to join. AFP also reports that guerrillas sent mortar or rocket fire on the Green Zone, killing 3 and wounding 7. The Green Zone is supposed to be safe and secure, and it contains foreign embassies as well as Iraqi government officies. The attacks may have been aimed at the Ministry of Defense, but fell short. 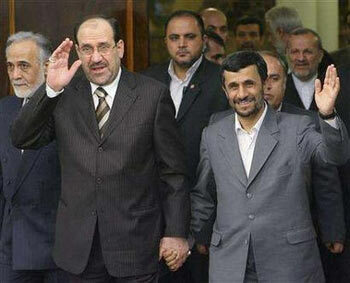 Just before that consultation with Ahmadinejad, al-Maliki had met with Iranian Foreign Minister Manouchehr Mottaki, al-Maliki assured his host that he would not allow Iraq to be used as a base by a third party for an attack on Iran. Bush and Cheney are desperately afraid that the next administration will get out of Iraq, thus removing the mercantilist advantages they were trying to throw to US oil companies in developing Iraqi fields. They believe they can commit the US to a long-term military presence in Iraq by becoming the guarantor of Iraqi security at least in the medium term, and by locking in that role through a security agreement between Bush and Maliki. Iran’s opposition is threatening to block this deal, and thus al-Maliki’s visit. Al-Maliki will also seek Iranian reconstruction help and provision of electricity. Al-Hayat reports in Arabic that its sources say that Iranian FM Mottaki informed al-Maliki of Iran’s opposition to the signing of a security agreement between Iraq and the US as long as Tehran does not receive guarantees that it will participate in a regional security order. Iraq wants to build a strategic relationship with Iran on the basis of mutual friendship and respect. The US is a strategic parter for Iraq, and Iran is a dear friend. Iraq is not an arena for the settling of scores between Washington and Tehran. Iraq will not serve as a staging ground for any attack on Iran. Iraqis want to build a democratic, not a sectarian, state. Al-Maliki wants an agreement with the US, but wants to confine US troops to their bases unless he authorizes an operation. He also wants private contractors to be subject to Iraqi law. His demands have thrown a wrench into the negotiations, since the Bush administration had assumed that the US military and its contractors could retain their current freedom of movement under a Status of Forces Agreement (SOFA). Note the supreme hypocrisy of the Republican Party. Bush and McCain are attacking Barack Obama for saying he would meet with Iranian officials. But they are perfectly o.k. with their man in Baghdad, Nuri al-Maliki, doing exactly the same thing. In fact, it may well come out eventually that Bush and Cheney sent private messages to Ahmadinejad via al-Maliki. Senior Ayatollah Muhammad Taqi Mudarrisi of Karbala denounced the provisions of the current draft of the security agreement, saying that they damage Iraq’s sovereignty and are therefore harmful even to the US image. Mudarrisi is an old-time Shiite political activist who heads the Islamic Action Council. He was exiled from Iraq during the Baath period, and trained some activist clergy from Saudi Arabia and elsewhere. – Around 7am, a roadside bomb targeted a police patrol in the New Baghdad (east Baghdad).Four people were injured including 2 policemen. – Around 10 am, a roadside bomb targeted a police patrol near the medical department intersection in Waziriyah neighborhood (north Baghdad) .Five were injured including three civilians. – A roadside bomb targeted recruiters for police commandos at Nisoor square .Four recruiters were killed and 23 injured. – A mortar shell hit the ministry of planning building near Jamhouriya bridge downtown Baghdad .Three people were killed and seven others injured. – Around 1:30 pm, a roadside bomb targeted an American patrol at Baladiyat neighborhood. No casualties reported. – Gunmen threw a grenade on a civilian car whose passengers were two of the ministry of defense employees in Atifiyah neighborhood. The two passengers were injured. – Police found four dead bodies in the following neighborhoods in Baghdad: 2 were found in Risafa bank; 1 in Atifiyah and 1 in Ameen .While 2 were found in Karkh bank; 1 in Hurriyah and 1 in Shoala.